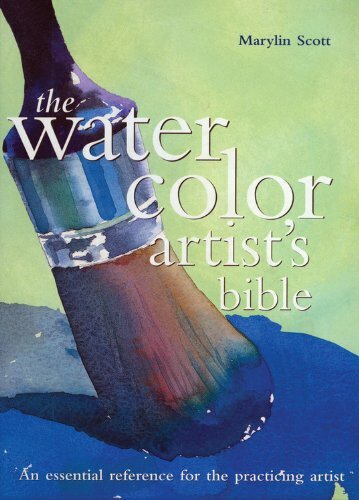 The Watercolor Artist's Bible is a nice and handy reference for beginner watercolour artists. It's a 192-page hardcover spiral bound book. There are just three sections in the book. The first talks about the materials, second on the techniques and third on the various subjects to draw. The section on materials is brief but useful enough. It presents a 12-colour palette and some of the mixes you can get out of it. For beginners starting out, the colour selection that forms the palette is quite good. The value of the book comes in the techniques section. There are over 100 step-by-step tutorials of the techniques featured. Tutorials on the techniques are shorter, while tutorials on the finished paintings are longer. The instructions are concise and come with photos of each step. There are lots of different techniques to experiment with. The last section is actually more of a gallery section featuring watercolour paintings from other artists. The text talks about the techniques used. There are a handful of lengthy tutorials that look at the painting process from start to end. It's a great value for money book for beginner watercolour artists.